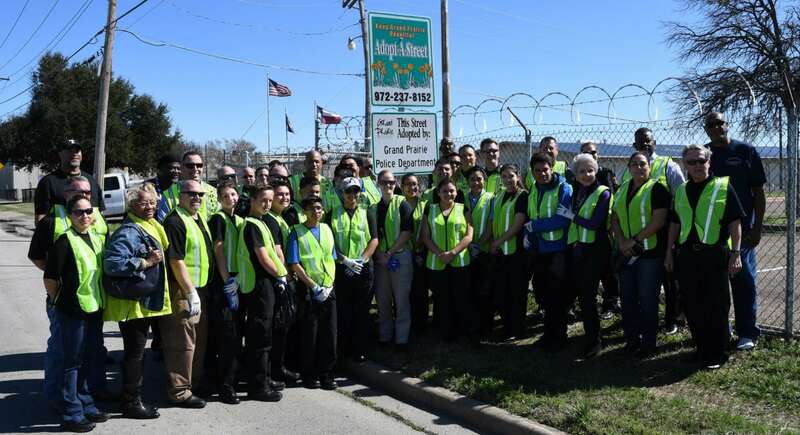 GRAND PRAIRIE—In an effort to keep our right-of-ways and neighborhoods clean and beautiful, the Grand Prairie Police Department has partnered with the Keep Grand Prairie Beautiful program by adopting a street. 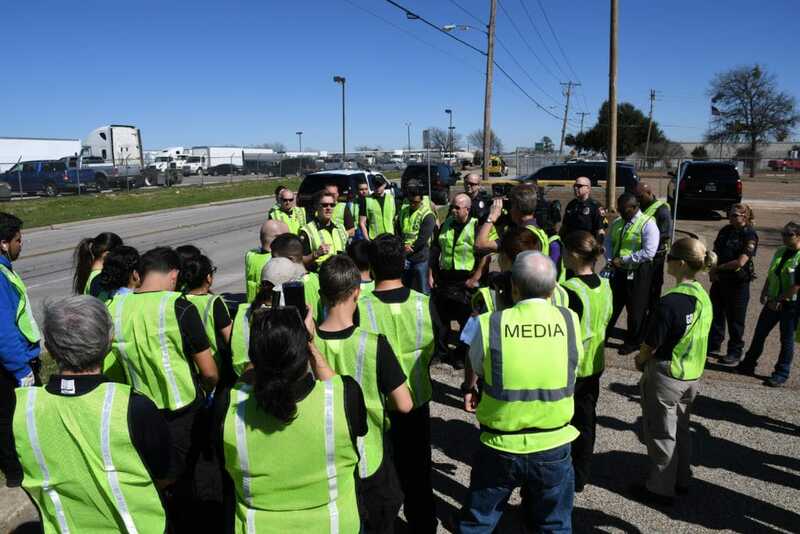 This first such endeavor is one of many ways Grand Prairie Police Department is utilizing an innovative initiative to take community policing efforts to a higher level. Grand Prairie Chief of Police Steve Dye and Assistant Chiefs gave a brief presentation of the Adopt-A-Street sign installation. Afterwards, several officers and civilian employees rolled up their sleeves to begin the beautification process. The signage location is at 2500 W.E. Roberts St., Grand Prairie, at the intersection of W.E. Roberts and Great Southwest Parkway in the Dalworth community. “We’ve enjoyed a longstanding relationship with the citizens in this historic community which is why we have selected it to be the first of several adoption areas,” said Grand Prairie Public Information Officer Chelsea Kretz. The Dalworth community began booming in 1912 after the Spikes Brothers Broom Factory moved there from Dallas, and the Dalworth Business College opened in what is now the historic Anderson Building. Soon, another community was established just south of the railroad tracks. The area, called South Dalworth Park, was home to the African-Americans who worked for Dalworth Park businesses and residents. Dalworth Park existed as a separate city until its incorporation into Grand Prairie in 1942. The Adopt-A-Street program is a cooperative effort between the city, residents, business owners, clubs, and organizations. Their mission is to help keep Grand Prairie a clean place to live. Once an adoption is in place, volunteers should clean their street four times per year. Grand Prairie Police will have two Adopt-A-Street signs installed at W.E. Roberts & Great Southwest as well as W.E. Roberts & SW 14th St.